We finally have a 'true' website for our imprint, Eggshell Boats. We set up EB for publishing poetry, literary fiction, that sort of thing — essentially to keep all that separated a bit from the fantasy and adventure and children's books we also publish. It is at eggshellboats.com or at eggshellboats.insolentlad.com. Yes, it is a subdomain at Insolent Lad Media now, rather than just a page. Somewhat bare-bones for the moment but we will update as we feel moved to do so. Before the first EB offering, the poetry collection VOYAGES appears, for sure. That is set for November 1, 2017. Most of our current poetry titles will be moved to Eggshell Boats, by the way. 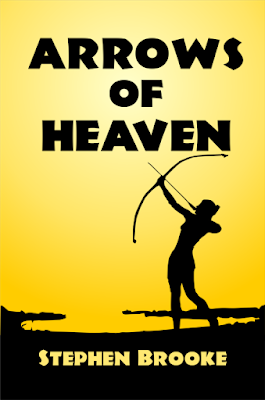 We announce the official release of Stephen Brooke's new fantasy-adventure novel, "Arrows of Heaven" for Sept 1, 2017. Available in print and ebook. The end of every epic is the beginning of another. Who was Teme? A noble girl, sister to the High King of all the Mora, and of an age to marry appropriately? Yes, she was this, but also a renowned archer, acclaimed by her people as a hero of the recent civil war, named in the epics bards sang across the land. Warrior or woman? Was it possible to be both? Through intrigues and adventures in the realm of the Mora and beyond, Teme has one quest above all others — to learn who she truly is.